President Mark and First Lady Debbie Kennedy developed the Eye of the Hawk Lecture Series as a way to bring the UND community together to discuss important topics with preeminent experts. 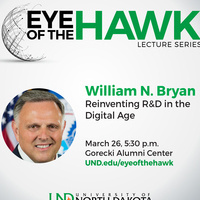 Join William N. Bryan, science and technology advisor to the secretary of the U.S. Department of Homeland Security, for an in-depth discussion on the modern meaning of peace through strength. Bryan leads the research, development, innovation, testing and evaluation activities in support of DHS operations and first responders across the nation. An Army veteran with 17 years of active military service, Bryan gained a wealth of experience through leadership roles in the departments of Energy and Defense. He’s played pivotal roles in addressing global energy challenges such as energy security, market volatility and hazard/threat impacts. Topics he’ll touch on include the Fourth Industrial Revolution and the technologies fueling it, advantages nations can leverage, consequences of surveillance and privacy and the consequences of a technological Cold War.